As a heating and cooling system operates, the formation of deposits, scales, corrosion, and other contaminates that form a stubborn coating and stick to the inner walls of the heat exchanger coils is a natural phenomenon. This coating of unwanted materials serves to reduce the efficiency of the system and the heat exchanger. As a result, the contaminants absorb the heat and block it from providing the cooling or heating needed for the home. This has been an ongoing problem for many years. 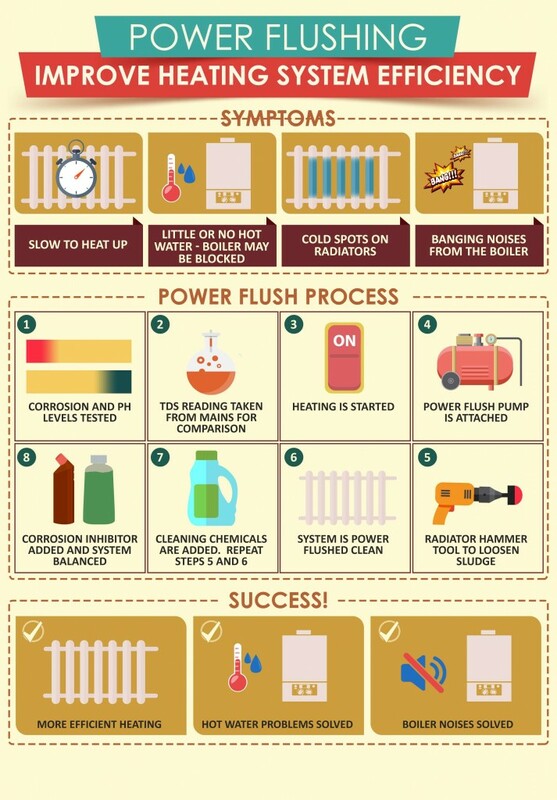 The power flush offers the quickest and most efficient method of flushing a heating system. The technician connects a Clearflow CF90 pump to the heating system at the most convenient location. This flow, combined with an instantaneous flow reverser dislodges and mobilizes the corrosion and deposits that resist many other methods of cleaning the system. Cheapest quotes around! Get in touch! What does a powerflush do? Once deposits are loosened, clean fresh water is forced through the system, and the contaminated solution is pushed out to the waste. During the process, each radiator is individually flushed with no need to remove or disconnect them from the system. When the flushing process is completed, the system is left with clean fresh water and a corrosion and scale inhibitor is added to provide long term protection to the system. In just a few minutes, the system is restored to normal operations. Limescale may also restrict or block the passage of water in the central heating system, especially at the boiler heat exchanger, affecting both water flow and water temperature negatively. The problem can be solved using a Power Flush pump along with descaling chemicals to dissolve lime and leaving the unit completely clean. After a powerflush your heating system, boilers and radiators will be sure to last longer. You will also reduce your monthly gas bills and you will find that your heating is for your property is much warmer with less noise coming from your system.